How much does it cost to travel to Aswan? How much money will you need in Aswan? E£295 ($17) is the average daily price for traveling in Aswan. The average price of food for one day is E£92 ($5.34). The average price of a hotel for a couple is E£250 ($15). Additional pricing is in the table below. These average travel prices have been collected from other travelers to help you plan your own travel budget. How much money do I need for Aswan? Lounging along the Nile like Egyptian royalty is a fantasy for most world travelers. 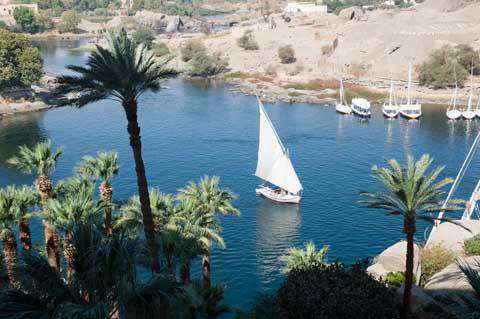 If you want to do it without the hustle and bustle of Cairo, there's always Aswan. This city in the south of Egypt is the smallest of the three major cities on the Nile. Located just below the Aswan Dam and Lake Nasser, Aswan's 275,00 people include a large portion of Nubians  mostly resettled from their flooded homeland. Immerse yourself in the history of Aswan  Egypt's former gateway to Africa. For starters, you'll certainly want to grab a cab to the Unfinished Obelisk. Stand in awe at this massive structure carved straight from bedrock. As of now, it is the largest known ancient obelisk. Imagine what it would have looked like if it had been finished. It would have likely stood 42 meters tall and weighed 1,200 tons. The real historical delight, however, is located on the West Bank. This area is home to the Tomb of the Nobles. Wander through and visit tombs of princes from the old kingdoms all the way up to the time of the Romans. The 6th Dynasty tombs are the most fascinating with hieroglyphic biographies and inscriptions. They tell the tales of the nobleman's journey to Africa. Be warned, many locals will try to block off passages and ask for a small fee for entrance. Give them a simple, "no thanks," and they should leave you alone. For a really neat experience, take a trip to the Philae Temple. Built as a monument to the Egyptian goddess Isis, this is the last temple built in the classical Egyptian architecture. But this is not where it was originally built in 690 BC. It has been moved by archaeologists to protect it from the flood of Lake Nasser. You still see the original home to the Philae Temple. There is an underwater island with steel columns sticking up, and that is where this beautiful temple once lived. Another amazing rescue is a bit out of the way, but worth the visit. In the small village of Abu Simbel are stunning temples relocated to the village just before the flood. The Great Temple of Ramses II is massive and intimidating, which is perfect given it was meant to scare off enemies approaching the area as they traveled down the Nile. For a little more unique background to the area, make a stop at the Nubia Museum. This attraction is rarely visited, so you won't have to deal with many crowds. Opened in 1997, this museum details what was lost beneath Lake Nasser. Beginning in 4500 BC and coming all the way to present day, you'll come across prehistoric artifacts, ancient Coptic and Islamic art and horse armor found in tombs form the 5th and 6th centuries BC. This region is typically meat for historical sightseeing, but there are activities to explore. You can always rent a bike for a leisurely ride across the Nile, or take a camel ride to the Monastery of St. Simeon. One opportunity you won't want to miss, though, is a trip to one of the Nubian Villages. A short boat ride takes you to small village where people keep crocodiles as pets. You are welcome to hold them, have a drink and wander the small and sleepy villages of locals. Because this region has so many tourists from all over the world, most tastes are covered. If you'd like to experience some of the local flavors, however, be sure to order some kafta, kebabs and freshly caught fish. More than a good meal, though, is a good view. Many restaurants line the Nile and offer a spectacular view any time of day  especially during sunset. This laid back city is so small, you really could walk or bike everywhere you want to go. However, if you're traveling to the Unfinished Obelisk or the Philae Temple be sure to take a taxi or horse-drawn carriage. As in most areas in Egypt, be prepared to haggle. Crossing the river is most convenient in a motorboat or felucca  a rented sailboat. Since the operators of those boats tend to overcharge tourists, a cheaper option is the public ferry.